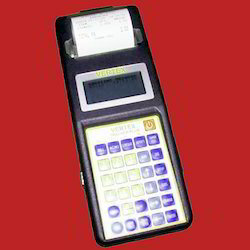 Prominent & Leading Manufacturer and Supplier from Mumbai, we offer Hand Held Terminal such as Portable Hand Held Terminal and Professional Hand Held Terminal. TRACKER Plus hand held terminals are designed using state of the art technology and customized for various applications like: billing, collection, distribution, ticketing, etc. Exciting features and simple user interface help you develop them easily and derive maximum value from business automation. USB Pen drive port to store data can connect External PC keyboard language printing PC / Mobile Software for Data Collection online Data Transfer both ways through GPRS. Distribution involves multiple activities like sale, order booking, payment collection, returnable item collection, returned item collection, offers etc., DISTRIBUTION Software running on TRACKER PLUS provides a gamut of features to capture these transactions easily and efficiently. Easy to operate and maintain, the offered Hand Held Terminal is highly user friendly in nature. Manufacturing of this range is done in accordance with the set industry norms and guidelines, utilizing the finest raw materials and modern machines. Owing to this, the offered range is known to have a superior performance and a high precision. Looking for Hand Held Terminal ?